How to Say Goodnight in Nepali Language: – Ending a day in a good way is as necessary as starting it in the right way. If the day is spent well and we sleep well, it is a given that our next day will also be happy and fresh. Therefore, to the ones who you love and care about, make it a habit to wish them goodnight before they go to sleep. That way, they will feel happy about the relationship you share and the day too. It will mean a lot especially when the person has had a long and tiring day. Just a little message to lift up the mood can go a long way in making them feel better. Saying goodnight and wishing them is the best way to do this. Just a simple wish in their inbox will lift up the moods and get them ready for the next day to get out and fight their battles in life. So it is a good habit to wish the people you care and love goodnight at the end of the day. Those who are near you, like your family, you can wish them goodnight personally before retiring for the bed. And, even if the people you love and care about are not by your side and you do not live together, it will not be a problem because you will always have your phone with you. In this day and age, there is no one who does not have a phone. So, you can swiftly place a call to the person you want to wish or you can also text the same thing. Also, there could be people who are living abroad and it gets too expensive to place a call. In that case, you can use the help of internet and all the social media as well as messenger apps that we have. Just log onto skype or Viber or WhatsApp or facebook messenger or any of the other app that you are comfortable with and send a message, or place a call. That way, you can talk to the person directly without having to worry about the cost of it. Most of these apps are for free. And with just this simple gesture of messaging or calling to say goodnight will make the other person’s day. They will feel like they do have someone who cares and loves them even though they are living far away from their family, relatives, country and their place of origin. The first and foremost and the most common is this phrase ‘Subha Ratri’. It means goodnight in Nepali. It can be said to your friends, elders, juniors or anyone you have to say it to. It is the most polite and common way of wishing someone goodnight in Nepali. In the literal sense, this line means: I am sure your day was spent well, now I hope that your night will also be spent well with a goodnight’s sleep. This phrase can also be sent to anyone in the list of your contacts. Be it friend, or relative or boyfriend or girlfriend or anyone. This line in English means that ‘I hope you get a good night’s sleep with beautiful dreams’. You can wish this to any of contacts you have. It can be applied to any relation and level of friendship. This is a general message. Be it friend, or relative or boyfriend or girlfriend or anyone else from the family or elsewhere, this message can be sent without ony awkwardness. This line literally means ‘Get rid of all the tiredness from the whole day and be ready for a new and exciting day ahead. Good night!’ It is a sweet message that you can send to anyone in your list of friends or relatives. The message is simple and sweet. And, I am sure the one who receives it will be really happy that you thought about him or her before you went to sleep. It will make their day for them. This wish literally means that ‘In order to make your tomorrow filled with joy and energy, I hope the night gets spent in good sleep. Have a Good Night!’ This is such a sweet and simple message that you can send to anyone on your list of friends. This message can be texted, messaged or even said out loud on call or personally. Anyone, including your friend, relatives, husband/wife, boyfriend/girlfriend, in-laws or any other could be the recipient of this sweet and beautiful message. This message literally means ‘ I wish that your nights be adorned with beautiful dreams and a restful sleep. Goodnight!’ It can be said to your friends, elders, juniors or anyone you have to say it to. 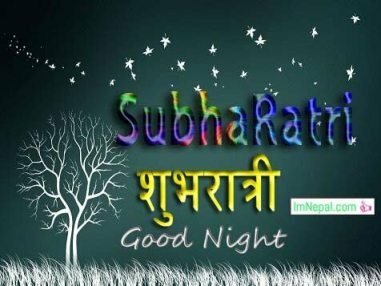 It is the most polite and common way of wishing someone goodnight in Nepali. Just a little message to lift up the mood can go a long way in making them feel better. This message is perfect for your boyfriend/girlfriend or husband/wife. When you know that the other person has had a long and tiring day and they are struggling with issues, you can send this message to cheer them up and ask them to forget all the pains and trouble for a night so that next day they can be fresh and ready to tackle through all the problems. This is a sweet message for someone you love and care about and you wish that they would forget the troubles for a while. Aba suta, ta ki ma timro sapana ma auna saku!! अब सुत, ता कि म तिम्रो सपना मा औन सकूँ ! This is a bit funny and naughty message that you can send to your boyfriend or girlfriend. This message literally means that ‘ go to bed my dear, so that I can come in your dreams’. The message need not be anything naughty but be careful while sending such messages to people you do not really know very well and personally. Send this one only when you know the relationship has gone to a comfortable level where you can share such kind of things. This one is a goodnight message that you can send out or say to your friend. This literally means that ‘There was nothing urgent to talk about, but this is just an excuse to remember you by, It is time to sleep my friend, have a good night.’ This is a sweet and beautiful message that you can say to your friend to wish him or her goodnight. If you can replace the phrase ‘sathi’ this can be used for your cousins, relatives or anybody else that you may want to wish goodnight to. This is a beautiful message in the form of poetry in Nepali. This beautiful message literally means that ‘You must have had your evening meal and you must have put on the mosquito net also in order to sleep. Now that you have finished all your work, what are you really waiting for? It is time to sleep. We can talk in the morning. Goodnight!’ This is a funny but simple message that you can send out to your friend or relatives or anyone in your contact list. However, do not send this or say it to any relation that is more formal in its form. It is an informal message that you can send out. The recipient will definitely chuckle before heading on to the bed. And this will definitely make his or her night a good night. This goodnight wish is more of a romantic one which can be sent out to your girlfriend or boyfriend, or husband or wife. The message literally means that ‘ I had called you in the morning, and in the afternoon we had coffee together. Until a little earlier, we were chatting too. Still, I can not be happy and fall asleep until I wish you good night.’ This message is sweet and funny at the same time. But, it also conveys the meaning that he or she cannot stay away from you and need you around or need to talk to you all the time. This is a good feeling and sending out this message will definitely make your love interest feel special and happy about himself or herself. Now this one is also a bit funny type of goodnight wish that you can send out to your love interest mainly. It can also be sent to friends or cousins but it is more suitable for your love interest. The message means that I cannot fall asleep until I wish you good night. The phrase, in the beginning, is a funny way of saying the same thing in the form of a proverb with a rhyming tune to it. This message will definitely make the recipient feel happy and will be laughing while he or she wishes you good night in return or goes to sleep. This would have made his or her day and got them ready to go to bed. This one is definitely for the love interest in your life. The literal meaning is that its been late my love, let us go to bed. This is a beautiful message and it does show the other person how you care and adore him or her and wish her good night every day. Your significant other or your love interest will feel good about this message or wish and you might also get reply in return wishing you goodnight too. This is a sweet and beautiful goodnight wish that you can send out to the person you care and adore. This one is funny and at the same time, sweet and beautiful good night wish. This message is also for the love interest mainly. But you can send it to any other relation where you can exchange wishes informally. It is a good way of saying that you like and adore that person so much so that you are always looking for ways to talk to him or her and be in touch all the time. The beauty of this message is its poetic form and rhyming pattern. This makes the message more beautiful to listen to while it also reads very nice. This is another message that you can send to the love interest of your life, be it your husband or wife or boyfriend and girlfriend. The message is simple and sweet and even funny. This will make the recipient chuckle for sure and will appreciate your effort to try to talk to him or her and always be in touch. The touch of humor in the message is what makes it so much better. It is sweet and innocent. Your significant other will like the message and give you a proper response for sure! If the day is spent well and that we sleep well, it’s an on condition that our next day also will be happy and recent. Therefore, to those with whom you’re keen on and care concerning, create it a habit to want them goodnight before they’re going to sleep. That way, they’ll feel happy concerning the connection you share and therefore the day too. It’ll mean lots particularly once the person has had an extended and wearying day. Simply a bit message to carry up the mood will go an extended approach to creating them feel higher. Spoken communication goodnight and wish them is that the best thanks to doing that. Simply a straightforward want in their inbox can carry up the moods and obtain them prepared for the following day to induce out and fight their battles in life. So it’s an honest habit to want the folks you care and love goodnight at the tip of the day. People who square measure close to you, like your family, you’ll be able to want them goodnight in person before retiring for the bed. And, even though the folks you’re keen on and care concerns don’t seem to be by your facet and you are doing not live along, it’ll not be a retardant as a result of you may invariably have your phone with you. During this day and age, there’s nobody United Nations agency doesn’t have a phone. So, you’ll be able to fleetly place a decision to the person you want to wish otherwise you can even text an equivalent factor. Also, there can be folks that live abroad and it gets too dear to position a decision. Therein case, you’ll be able to use the assistance of net and every one the social media additionally as traveler apps that we’ve got. Simply log onto Skype or Viber or WhatsApp or facebook traveler or any of the opposite apps that you just square measure comfy with and send a message, or place a decision. That way, you’ll be able to talk over with the person directly while not having to stress concerning the price of it. Most of those apps square measure for complimentary. And with simply this easy gesture of electronic messaging or occupation to mention goodnight can create the opposite person’s day. they’ll desire they are doing have somebody United Nations agency cares and loves them even though they’re living isolated from their family, relatives, country and their place of origin. So, make sure you cultivate a habit to wish goodnight to the person you love and care about. The phrases and messages are given above, in Nepali, will definitely help you a lot in this regard. How to Say What Is This In Nepali Language – Learn 8 Ways to Say What’s This?